Mutual Fund Mobile Apps – Mutual Fund is one of the best investment options for the long-term. You can invest in a mutual fund directly or via distributor/agent. In order to improve services and investor experience, most of the mutual fund houses have launched online portal and mobile apps. You can use Mutual Fund Mobile Apps for investing in the mutual funds on the go. You can even track your mutual fund portfolio using these apps. There are multiple mutual fund mobile apps available in the market. In this post, I will share detail about 10 Best Mutual Fund Mobile Apps. These apps will help you to invest and track your mutual fund portfolio on move. Here is the list of Best Mutual Fund Mobile Apps along with key features. Make sure to compare all features before selecting the best mutual fund mobile app. The first mutual fund mobile app in the list is myCAMS. Key Features of myCAMS Mutual Fund app is given below. You can invest and track multiple mutual funds using myCAMS app. This app is easy to use and operated from MPIN. You can invest in mutual funds via SIP, lump sum and NFO. You can set my watch list to monitor your investments. App provides schedule transaction option for setting up future transactions. You can view PAN level portfolio. KYC update and Aadhaar based eKYC on the move. You can redeem or switch funds using this app. The only drawback of this app is it does not support some leading mutual funds AMC like Franklin India, Reliance Mutual Fund etc. You can download this app from Google Play. Coin by Zerodha is next in the list of best mutual fund apps. It is commission free direct mutual fund investment platform. All investment done via Coin Zerodha is completely free. Key Features of Coin by Zerodha are given below. You can have a single unified portfolio view for all direct mutual funds, ETF, stocks and bonds. Coin provides detail about Annualized (XIRR) and absolute returns. It supports UPI payment for SIP. Coin offers Single capital gain statement, P&L visualizations. You can create, pause, and modify your SIPs anytime with click of a button. It provides a clean and simple user interface. Coin is free investment platform and offer facility to invest in direct mutual fund. You should try Coin for Mutual Fund Investment. You can directly download Coin from App store. Groww is one of the best mutual fund mobile apps. You can invest in direct mutual funds with zero commission using Groww. Key features of Groww are given below. Dashboard for tracking all your investments. Calculate returns through mutual fund SIP calculator. Mutual fund recommendation by experts. Facility of switching to direct mutual funds for free. Buy and sell mutual funds with few clicks of a button. One time KYC facility within the app. Groww app is becoming popular for the mutual fund investment and tracking. You can download Groww App from App Store. Also Read – How to invest in Mutual Funds via Paytm Money? Paytm Money is the latest app for mutual fund investment. Paytm App eliminates a need for physical paperwork. Key Features of Paytm Money are given below. You can open your investment account online with full digital KYC within 30 minutes. Track and manage your portfolio with real-time updates. Watch list facility and bookmark facility for the mutual funds. Returns calculator for amount and time horizon. Zero commission and Zero transaction charges. You can import your existing mutual fund investments. Paytm Money app is getting popular due to the facility of investing via UPI. You can download this app from App Store. Scripbox is easy to use a mutual fund investment mobile app. Scripbox app is complete financial planning tool. Key features of Scripbox are given below. You can invest in the mutual funds via Scripbox. You can track your investments using this app. There are multiple calculators available in this app. You can get complete wealth check-up using this app. You can download Scripbox from the App Store. Another best mutual fund app is KTrack by Karvy. Key Features of KTrack Mutual Fund App are given below. KTrack allows you to generate reports automatically on screen. You can get account information, portfolio, and common account statement and last five transaction details. You can get a graphical view of portfolio composition. You can purchase, redeem, switch and set SIP as per your requirement. You can also avail other services like miss call service, Easy SMS service. Overall KTrack is very good mutual fund app for both investor and distributor. SBI InvesTap is an app for investing and tracking SBI based mutual funds. Key features of SBI InvesTap are given below. Quick and secure login using MPIN or OTP. Invest and set SIP in all SBI MF on the go. Multiple Investment options including net banking, debit card, UPI account and onetime mandate. SIP Calculator for estimating future returns on specific schemes. Access to NAV and graph up to last five years. You can get real-time alerts and notifications for tracking NAV. You can get an option for scheduling your transaction. Overall it is a good App for making investments in SBI based mutual funds. FundsIndia is one of the best mutual fund app. FundsIndia mobile app allows you to invest in mutual funds and equities. The key features of FundsIndia Mobile App are given below. Sign up for SIP and Invest instantly using Aadhaar Number. Option to get investment recommendations for goals from robo advisor – Money Mitra. Get access to all the investment portfolios in your FundsIndia account. You can read the latest investment news and recommendations from FundsIndia’s experts. You can monitor and track your fund performance. FundsIndia app allows you to invest in almost all mutual funds. It is one of the best apps for the investor with FundsIndia account. ETMoney is complete financial planning app. Apart from mutual funds you can use this app for expense tracking, money management, instant personal loan etc. Key Features of this app are given below. Track & Manage your expenses, existing SIPs & mutual funds portfolio. Invest in Direct Mutual Funds via Lumpsum & SIPs at 0% commission. Automate Tax Saving by investing in ELSS. Borrow money via Instant personal loans. It is three in one app for investment, loans and expense management. You should use ETMoney for investment and spend management. fisdom is one of the best mutual funds mobile app. Key features of fisdom app are given below. Invest in mutual funds directly on the move. Track and monitor returns of your investment in real time. Withdraw your investment anytime using fisdom. You can also use this app for KYC. I am sure that, these mutual funds mobile apps will help you to invest and track mutual fund portfolio from a single location. You need not log in at multiple platforms for investing and tracking mutual fund investments. 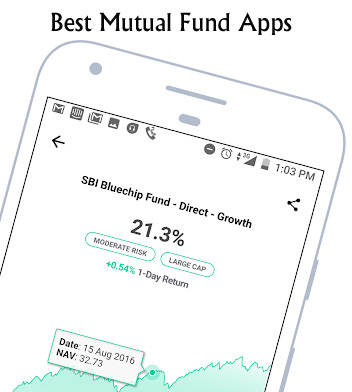 Select the Best Mutual Fund Mobile App, download it from Google Play or InTunes and start investing and tracking your portfolio. Few additional mutual funds apps that you can evaluate are WealthTrust, Piggy, Investica, Angel Bee, Fund Easy and Asset Plus.